NEW EXCLUSIVE AREA FOR OUR CUSTOMERS, BODEGA-DINING ROOM WITH BARBECUE, enjoy your meals on the grill with your people without worrying about the weather in our cozy dining room with barbecue. The rural house Tinao de Gredos has been built on an old tinao using its original material, stone. 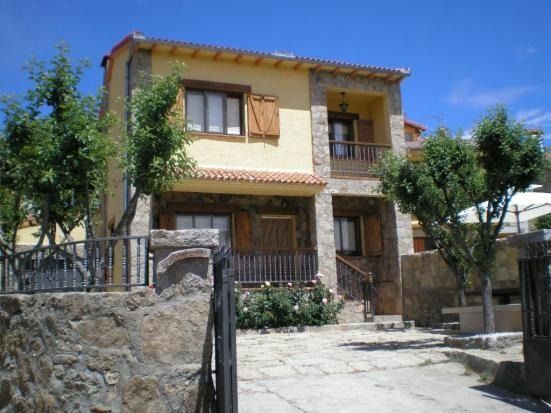 Located in a privileged place next to the National Tourist Office of Gredos in the heart of the Regional Park of Gredos. You will enjoy in the house the best views of the mountains from your terrace and balcony. Decorated throughout the house with wood and handmade forge made by the owner. The roofs with wooden beams throughout the house, barbecue and fireplace in the living room where you will enjoy the fire and the contrast of having behind them the Sierra de Gredos Nevada. In addition, we have a lounge-cellar with independent barbecue. Enjoy your meals on the grill without worrying about the weather, our picnic room incorporates a barbecue in an artisanal environment with its wooden roofs and rustic furniture that will provide a comfortable and pleasant stay. The tinao de gredos offers all the necessary comforts within a rustic environment. It is located in a key point of the regional park that gives access to a natural environment where you can practice all kinds of activities, from hiking of greater or lesser difficulty, to the simple relaxing walk through the pine forest of Navarredonda de Gredos. The beauty of its surroundings and the tranquility that it breathes are an invitation to rest and relaxation. If you are looking for activities to do with friends or with children you have the option of horse riding, cycling, donkey, paintball, zip lines, active nature park also in different levels of difficulty. In addition, we have a lounge-cellar with independent barbecue, exclusive use for our customers. Enjoy your meals on the grill without worrying about the weather, our picnic room incorporates a barbecue in an artisanal environment with its wooden roofs and rustic furniture that will provide a comfortable and pleasant stay. That does not condition your grill the time, we make it more comfortable, do not go cold, it rains or snow we guarantee with our covered dining room that you will grill. Casa muy bonita y con todos los servicios. El salón con la barbacoa lo que más nos gustó. Estuvimos pasando un fin de semana en familia, los propietarios nos hicieron sentir como en casa. A la casa no le falta detalle y está todo en perfectas condiciones. Recomendable 100% para viaje con familia. Estuvimos pasando el fin de semana con niños y la casa es muy bonita. Es tal y como se muestra en las fotos de la web, amplia y en un entorno precioso con unas vistas maravillosas. La casa esta muy bien equipada con todo tipo de electrodomésticos y además está super limpia. Los dueños son encantadores y nos han facilitado todo tipo de información sobre la zona, actividades y donde comprar lo que hemos necesitado. Nos ha gustado mucho, el entorno es muy bonito y además muy tranquilo. La recomiendo 100%, nosotros seguro que repetiremos. La casa tiene todo lo que se necesita par desconectar, relajarse y utilizarla de base para disfrutar Gredos. Los dueños encantadores, siempre dispuestos a ayudar. Nos aconsejaron con los sitios recomendables para visitar en la zona. La casa es tal y como se muestra en la web, el trato con el propietario fue buenísimo, a la casa no se le puede poner ninguna pega, todo estaba perfecto, muy limpio, todo muy nuevo y con electrodomesticos de primeras marcas, entorno muy bonito y tranquilo. Fuimos un grupo de 8 amigos con nuestros perros, en total 7 mascotas, en ningún momento el propietario nos puso ninguna pega por ir tantos y todo salió a la perfección, la casa tiene un patio exterior cerrado de lujo para nuestros animales, la bodega con barbacoa una maravilla, lo pasamos muy bien y por supuesto que volveremos, de los mejores alojamientos en los que he estado. De las 8 personas que fuimos ninguna hizo una valoración negativa de nada, quedamos encantados.